TempleNile.com was launched in October of 2018 and has already gained a strong foothold across a number of key iGaming markets. The casino, which is hosted on the Whitehat Gaming platform, has an outstanding array of games, including live dealer games from Evolution Gaming and 100s of real money slots. Temple Nile is licensed by the United Kingdom Gambling Commission, Swedish Gambling Authority and the Malta Gaming Authority. Opening a new account at TempleNile.com is a quick process and simply involves entering in your personal details and following the prompts. You will need to verify your account (prove your identity) before you can withdraw any winnings, but this is as simple as following an online form, or supplying documents via email. 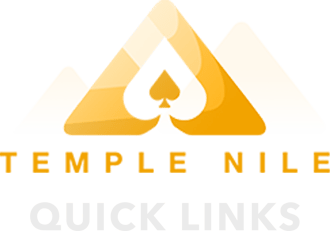 Temple Nile Casino has only a short history in the online casino business, but the people behind it have more than 30 years experience in the industry — which should give you the confidence that they know what they are doing. The casino has an Egyptian theme and has obviously been created with the user at the front of mind, with an easy-to-navigate layout and everything you would use often generally just a click away. TempleNile.com has some great promotions for new players, varying depending on the currency in which you wish to play. For instance, if you are in Canada the bonus is a 200% matched deposit up to the value of $500. This means you can deposit $250 and have a total of $500 to wager with. The casino will also give you 30 extra spins when you make your initial deposit. 40x turnover requirement on extra spins, bonus money and deposit. Players can accrue Temple Tokens simply by playing at the online casino. These tokens are displayed prominently after you have signed into your account and can be redeemed for various prizes which include things such as smartphones, holidays, laptops and gift vouchers. There are three tiers to the Temple Nile VIP Rewards Program: Silver, Gold and Platinum, while there is also a super-exclusive fourth tier that is by invite only – known as the Premium Lounge. Basically the more money you deposit at the casino the higher your VIP level will become and the more features you unlock. This includes things such as having a dedicated account manager who can look after your every whim at any hour of the day and receiving some nice cash-back and deposit bonuses. When you open a new account at Temple Nile Casino and make your first deposit you are automatically inducted into the lowest level of the VIP program. Temple Nile Casino has a selection of games from over 30 different software providers, including many live dealer titles and an abundance of real money slots games. Like all online casinos they must abide by restrictions software developers place on them about where their games can be played in the world. This means even if the casino has Microgaming titles, you may not be able to play them if you are in a country where this brand is not licensed. Other games included at Temple Nile are every kind of live dealer you can imagine — including roulette, baccarat, dream catcher, three-card poker, casino hold’em, Caribbean stud, blackjack and even unique games such as Football Studio by Evolution Games. Other RNG games include the full complement of table games, poker variants, video poker, scratch cards and many other different titles. The games at Temple Nile are provided by various software developers, including some of the industry’s most well-known brands. Like all of the modern online casinos TempleNile.com has an outstanding selection of mobile games on offer, all via its responsive website, which is fully functional across all of the different screen sizes. You will find that some of the games available on desktop are not available on mobile, which is through no fault of the casino. Rather it falls back on the developers who have not made their games for mobile devices. It is possible to sign up via mobile, and other features of the casino like the Temple Bazaar and VIP program are also accessible on your handheld devices. Withdrawals at Temple Nile Casino take a minimum of two days to be processed and are done manually by staff, as part of their effort to curb money laundering. If you make your cash-out between midnight on Sundays to midnight on the following Saturday you will be paid on Tuesday with the money taking 2-3 working days to hit your account. You will be required to verify your email, which is as simple as checking your email after sign-up and clicking the link in there. The casino also uses a third-party age verification check which basically confirms that you are 18 years or older. If this check fails you might have to send in a scan of your licence or passport. The casino will also verify your address and other details by a third-party check, which again if it fails, you will have to send in documents that are requested. This needs to be done before you can make a withdrawal. At the time of writing Temple Nile Casino has three licences, including the new Swedish licence which only came into operation at the start of 2019. It also has United Kingdom and Malta licences. Temple Nile has received strong player reviews in its short time online. Have you had an experience at the casino you would like to share or do you need help with a problem? Feel free to drop us a message and we’ll get back to you soon.